Tuesday evening Zee Marathi show Saregamapa Little Champs had judge Devaki Pandit back on the show as celebrity judge. We are now so used to the sweet comments by Vaishali & Avadhoot that we had almost forgotten all the “पण” comments. Devaki was in her usual self, pulling all little champs down to earth. Finally almost all got the same प-प marks with 1-2 exceptions. However amidst all these comments there was one comment which I did not like at all. <!– –>We all know how serious Devaki is about her music. She has her own style of singing and has tremendous passion for correct (rather perfect) notes and renditions. She is always unhappy about her performance and that keeps her going. However expecting this from everyone is a bit too much. In terms of stage performances for light music, Devaki is not as good as she is for classical or semi-classical. In fact I find her quite boring. I have seen her singing live during the finals of the celebrity special show of Saregamapa. For such a bright and happy moment she chose a very sad song which was completely out of synch with the rest of the show. Even during the finals of last season, where Vaishali Made won the crown, Devaki sang a so-called remix of Pt. Jitendra Abhisheki’s song. She was horrible. Initially she was “बेसूर” and only after the editing of the show, the song was a bit better to our ears. Live stage performance (Light or filmy music and not the classical or semi-classical music) is a different ball game and Devaki is not made for that. On the other hand, Shalmali is a complete performer. We saw her singing the “कशाला उद्याची बात” on Monday. That was a mind blowing performance. Her singing was good. She was completely involved and her whole body sang with her. The very next day, Devaki objected to this saying she should focus on correct sur and keep the facial expressions, acting etc. aside. I feel this is completely wrong. A performer need not be a bore. Because the playback singers can not act or dance, they are playback singers. Audience wants a complete package, therefore Indian film industry has this unique concept of playback. Actors act and dance and singers sing. But when you get all in one person, why should you object. Shalmali is completely involved into her singing and that not only gives her pleasure but it is a joy to watch her as well. Conventionally she is not a beauty but it is her involvement and commitment to the song which pleases our eyes and ears and touches us. So Shalmali! you are good as you are. Listen to any other advise about singing better but don’t be a bore. Be as cheerful and as lively as you are, we will come and listen to you, see how you perform and enjoy it completely. Keep Asha Bhosale as your idol and be like her, perfect yet very much cheerful, lively and presentable. I received few comments on my article on Raj Thakre & MNS – the road ahead. Most of the comments on the article and the entire electronic media specially Hindi & English had only one point to say – “Look at the violence Raj & MNS have done. Look at the loss to public property. This is the reason MNS should be banned. Raj is dividing the country. We should not encourage this and this should be one country.” My daughter also reacted in somewhat similar manner like the last statement. But it was far more effective than the comments. She said all of these guys must be asked to say the prayer “India is my country and all Indians are my brothers and sisters…” Well said Janhavi. I was wondering, when everyone is objecting to the violence in Mumbai, did these guys not see what was happening in Bihar as a reaction to this? There the students unions hijacked a TRAIN ENGINE. Now isn’t that a bit too much. If the MNS is burning buses here, Bihari students are burning whole train there. Is that not property of the nation? More than the busses of local governing bodies, the train is really a NATIONAL property and not state. But then no one is surprised because it is BIHAR. Anything is possible there and one wont even wink after hearing horrific stories of crime, vandalism over there. It is all accepted. Can you show courage in UP & Bihar to change situation there? One person commented that he had to leave Bihar as there are no jobs over there. He also said that he is willing to stop any vandalism by taking personal risk. I really sympathize with his situation in Bihar and appreciate his courage. But will he dare to show the same courage in Bihar? If all these poor Biharis and UPites show courage in their own state and fight the landlords and politicians there, they don’t have to come to Mumbai or Maharashtra for roji roti. Sitting here in sophisticated well cultured state of Maharashtra (This is comparative statement and not absolute truth… please…) it is easy to talk about courage. Why the common man is falling for Raj’s arguments is because he is seeing his culture is under threat. His cities are under threat. Even after taking out terror activities, there is lot of crime coming to the cities of Maharashtra from up North. (Once again this does not mean that there are no criminals in here. But the level of criminals in MH and Northen states is quite different.) Can you imagine ladies roaming freely & safely in the night in any of these North Indian cities? Coming back to the main point, go anywhere in India, political vandalism is not an exception but a rule. Raj in one of his interviews said that Gandhiji’s non-violence was for well mannered British (I am sure he treated General Dire as exception) and it is no longer effective against today’s politicians and bureaucrats. Forget about the British but is this not really true for the current situation? So the question is what is the most effective way to influence the politicians other than money to do the good and right things? Between the 5 years of election how can we get things done the right way and not what majority thinks is right. Democracy in itself is a flawed concept but we do not have better alternative. Presidential democracy could be more effective in India as historically we are used to monarchy. But still… The purpose of any political system is to raise the bar, raise the living standard of the people. We are lucky to be in the current economic boom. This was possible because we have one learned PM backed up by one equally learned FM. (Narasinha Rao & MMS). But then in general the politics has been driven by electing a representative from the most deprived people and not the best person who can do good to all. The very sentiment that the person from other cast cannot help my cast has divided the country long back. We are seeing Raj dividing the country but he is uniting the Marathis irrespective of their cast. Recently he spoke about reservations. He said that when we are set to work for all where is the question of doing favor to one cast or the other? Is this not far different from other politicians? Back to the point… that in democracy in India the overall standard is actually being averaged out. Rather than choosing the best of the best, we are choosing best amongst the worst. So the politician you can expect to deal with your non-violent techniques is a very thick skinned person who knows that you are not going to hit him back. So he resents to all possible techniques of delaying justice their by denying it. In Rang De Basanti movie, Rakesh Mehra suggested that violence against the politicians can be one ways to fight the injustice. But no one actually wrote back that violence is not the solution. Most of us feel that violence against corrupt politicians is the best way to fight them. So should the common party worker now seek this solution rather than damaging public property? Will YOU be that type of party worker for MNS? Non violence sounded so good in Lage Raho Munnabhai that many people fell in love of that and started sending flowers. Soon they are realizing that there are not enough flowers in India cause then everyone will get at least one flower a day, at least in the cities. Don’t you think so? Next time when you litter/ break a traffic rule/ give 50 bucks to the cop think of someone giving you a flower and saying get well soon. Violence against corrupt politicians is not an easy option. These days they have Z grade security. Raj’s Z grade security is removed after the bail. So now you tell me how can we effectively deal with corrupt politicians? The only way is to increase number of good politicians. My second suggestion is to remove current reservation system which is based on cast and bring in system based on economic state. What is the best way to eradicate cast system? Just completely delete it. For the computed geeks do a shift+del. No one should ever be asked about his cast ever again. But let’s say if the government stops asking anyone his cast, why would one need it? Where do you need it today in business? So just delete the cast system from the country. Then the natural vote banks will be gone. Similarly the government can also think of religion. Never ask anyone of his religion. How does it matter in business? It definitely does not matter in arts and sports. I read an article in TOI about a lady who traced a system similar to cast system in France. She had hard time tracing these deprived people because there were simply no records of them anymore. So why is this not possible in India? Let’s remove this hippocracy from our society. I believe this will to a great extent remove cast based politics from our country. So when the vote banks are gone, the chances of having better politicians are more. any politician today. No one has more than 50% votes. Today in my city when I see what the general public calls social work or political work is about following items: 1. Organizing Ganesh Festival/ Navratri festival/ Dandiya 2. Organizing blood donation camps 3. Organizing competitions of record dance, singing, rangoli etc. 4. Helping people to organize death rituals 5. Sitting at the paan tapri and socializing and so on. Now consider this. Today organizing a festival is far more simpler. You just need to collect money. Rest almost everything is done by vendors including decoration. You don’t have to sing prayers. CD players to that. You don’t have to do much in organizing the blood donation camp. The blood bank and pendal contractor do most of the work. You need few posters. The competitions don’t need participation of the workers. Mandap, guest (this is mostly local leader to get publicity) and prizes. So in short it has become very easy to do this type of social work. The politician of today is coming from such background. The choice of party is hardly based on the ideology but just a matter of convenience, contacts or rivalry. Where is the character building required to be in politics? That is the reason today’s politicians change parties like shirts. So when character/ principles are not required to succeed in political work, people who can manage everything become leader. Their followers believe that the leader can do anything to give them what they want. The role of media is very critical in changing this outlook. But they do not want to focus on this. They want to focus on “NEWS BITE”. In such scenario if one wants to get good things done what is the most effective option? MNS supporters have chose the easiest one. Pick up a stone and throw at anything. This is the only way they know to vent anger. So are the party workers of any party. It is not really character of only MNS. The need for principle based politics is far higher today than in any other time. Rethink about what Narasinha Rao & Manmohan Singh did to this country. The drama of Raj Thakre’s arrest and bail kept all news channels busy for two days. So much so, the “Chandrayan” news did not get enough viewership across India. Now that he has got bail and the atmosphere has cooled down, we can look back and see that the core issue in this whole drama has gone for a toss. The aftermath, mayhem or whatever names were given to the incidents post Raj’s arrest, are not the real issue. The issue is about jobs, migrants. Across the entire world, migrants are always an issue. Those who call themselves as sons of soil, were migrants few centuries back. So who really are the sons of soil? USA is a land of migrants. I saw lot of analysts on the news channels citing examples of USA but all those are irrelevant in India. Primarily because US history is not even 1000 years. Whereas India has at least 5-6 thousand years of history. I work in an IT company and many of my colleagues are working in different parts of the world. To us migrating to some part of the world always looked right. But still somewhere, deep inside, I was supporting Raj. I kept wondering why is this happening? Am I right to think so, when I myself have gone to parts of world for my job. The answer probably lies in the level at which we work. Most of the work we do is a skilled job. It is not something anyone can do. While the jobs for which Raj & MNS are fighting are low, semi or unskilled jobs. With a huge inflow of migrants in Maharashtra (Not just Mumbai), local people are losing these jobs. In many of the industries being set across the state, it is same situation. Mumbai today specifically is dominated by Bhaiyyas and Pune is also going the same way. Is this my native place? If in my hometown, I am not able to speak my mother tongue, where the hell in the world will I speak it? What is the difference in that case between Pune & Lucknow? Now this is causing me worry somewhere back of my mind. I remember the Marwari family who ran shop in our neighborhood. They sent their children to our school. All of them speak Marathi very well. Now a days every where I have to use Hindi. This change is not so visible to younger generations as they have not seen the world before computers. But then we have seen it. So what causes these migrants to stays here forever and start influencing our culture? One is that the common Marathi Manoos (Now that has become a clichéd term) has very low ego. He does not mind speaking other language to communicate. Down south it is the other way round. The ego is more like pride. Second, the bollywood movies and recently Hindi channels have taught the Hindi language to most of the urban, semi urban Maharashtra. Third, their is no control over the minimum living standards enforced by state or local bodies. In a 10 ft x 10 ft room 10+ migrants can easily adjust their life, there by reducing the cost of living. Slums get authorized by state government after few years, local bodies provide them all essential amenities like water, electricity under the sweet name of humanity. Fourth, the local people again don’t mind employing migrants as they are cheap (not always best. We have some security staff from North, who are sooooooo dumb. You can not call then skilled) and they don’t mind doing business with migrants. There could be more. I wont repeat the ones about political will as they are listed in all news papers. Now if MNS wants to ensure that the local people get more jobs, then there are some tactics that need to be played. One – raise the pride in our own language, culture. Two – make the language and culture more modern so that the younger generation can associate with it. Give glamour to the culture. Three – impose laws of minimum living standards and throw people living below that standard out of the cities/ towns. If housing is cheap due to slums, make it costly by taxes. Four – strategically target employment and businesses these migrants work into. Develop attitude of service, entrepreneurship locally and at the same time non-violently block the daily bread and butter of the migrants. Five – force local language in all possible communication. Encourage attempts to simplify the language, find new cool words for their counterparts in English/ Hindi. 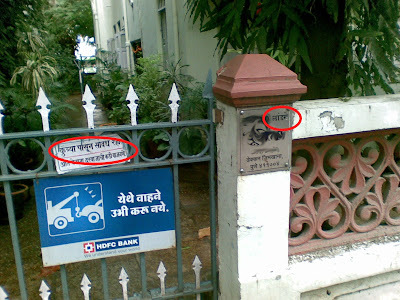 Allow a little bit of mixture of words from other languages and make Marathi richer in word power. Six – Get more Marathi officials in government. Throw the outsiders out of the state. Readers of this blog can suggest more options in the comments. But all this is a long term strategy. In short term when you want to do this, it has become extremely difficult to get things done in a real non-violent manner. The politicians, the burocracy are so thick skinned here that today they can simply deny justice by delaying it. When the MNS guys take law in their hands, they get support because of the insensitivity of the government. People have now started feeling that this is a right measure to enforce law. (Remember the police and people beating the thieves to death or another being towed away with legs tied to a bike in Bihar?) This phenomenon is not limited to Maharashtra. It is all across India. The only answer to this is with the politicians. They need to be principle centered than looking at petty politics. Lastly some questions to Raj Thakre – If his party comes to power in Maharashtra, who will be his ministers? (Not just the CM. The other ministers as well.) The current photographs we see on the banners across the city are not really promising, high caliber supporters. Second, when Sena-BJP combine came to power, these parties did not know how to boost the economy of the state and how to provide more jobs to local people. What is MNS’ strategy to do this? This Saturday, I went to ICICI bank for reducing my housing loan tenure. In first place, in the attempt to keep the EMI (Eqauated Monthly Installments) same, the bank had increased my tenure to something as unpractical as 470 months (Over and above ~2 years of repayment I already did). Now that meant that I will be repaying my home loan till I become 80. Now why was the bank so sure that I will be able to pay my EMI till that age? I found it impractical in first view itself. Anyways… I though I need to get this updated ASAP. Meanwhile bank also sent me letter that they are not able to keep the EMI at same amount and have increased it marginally. I should go to the branch and take corrective action. I reached the bank at 1:00 PM. The waiting area was full with nearly 70-80+ people. But since there is only one branch for the whole Pune city, I had no option but to wait. Having nothing to do, I started observing which counters are taking housing load queries. It is easy as the token number has specific prefix for such queries. I found that there were about 3-4 counters where these queries were attended. But soon after two of the counters stopped appearing in the list. Thinking that it must be lunch time, I looked at those counters. To my surprise, I found that these two counters were attending only one customer. I had to leave the bank by 3:30. I went to the help desk and got a reply that customers have lot of queries and the executives can not shorten the time taken. Is there any SLA for the executives attending the customers? I found the two ladies attending the housing queries taking one hour per customer. Although customers have queries, is it justified at such rush hour to take so much time? Unable to answer my queries, he did the best he could. Allowed me to jump the queue. He asked one of those ladies to take up my work as soon as their work in hand was over. In yesterday’s Zee Marathi Saregamapa Little Champs, Ketaki Mategaonkar moved out of the race due to her bad performance in last episode. For past few episodes, she was experimenting. I believe that costed her dearly in this competition. Ketaki is a very good singer just like her mother Suvarna. I believe two factors worked against her. Her song selection and to some extent, biased judges. Her selection of the Kelewali song from the thousands of songs, Mangeshkar family has sung/ composed, this song itself was non-starter. She got appreciation for her singing but the judges really were not fair to her giving MM to her. She was definitely better than Kartiki and Sagar. Sagar is improving now but his earlier performances were definitely week and he should have been out by now. But he is lucky. Ketaki was not. I am sure with all the grooming she has had and the support from her family, we will see her sing at professional level pretty soon. She will have to work hard and this result will make her take her singing seriously. Sometimes, she is very casual. May be out of overconfidence. I just came across the chronological list of bomb blasts in India on NDTV. I am just summarizing this table here adding columns for people killed and injured. Now if you see the other news that hit us from Jodhpur was about the stampede in the temple. This whole messy management killed 147 people and 55 injured. The one before that was the Naina Devi Temple Stampede. In this a total of 162 people were killed. This was not restricted to Temples. The infamous Sari Stampede in Lucknow killed 22 women. Compare all this with the terrorist attacks and you will find that all that labor and intelligence, secrecy, funds behind the blasts are simply ineffective. Except for the Mumbai train blasts, none of the other instances have been close to the temple stampedes. Such is the state of discipline, crowd management in this country. Despite all this, people will still flock the temples on specific days putting huge pressure on administration. So when such incidents marginalize the impact of terrorism in this country, I do not understand why these guys are spending so much of their energy in such useless stuff. Yesterday’s Zee Marathi Saregamapa Little Champs results were a complete disaster. I was expecting Kartiki Gaikwad and Sagar Phadake would be out of the context based on their performance in current episode. Kartiki was just like any singer in a train. She did not show any of her previous capabilities in this episode. Sagar on the other had sang OK. But I have started hating his attitude. He is just too overconfident compared to what his singing talent is. He is a performer by definitely not a good singer. His song selection was poor. He was out of tune and was complete lack-luster. I can understand Sanchita Garge did not do much well either. But the other poor girl, Rageshri Vairagkar was no way a contestant to go out. This show is a contest and if someone does not perform well on a particular day, he/she should be out. Judges should not look into their past performances. In this show we are constantly observing that for someone who is obviously singing bad, is getting good marks because they are in the good books of the judges. My observation about Mangesh Borgaonkar’s sister in last regular contest was that she was sometimes jacked up in the contest because of her background. Finally somewhere the common sense prevailed and she did not go very far. But it seems that history is repeating. I believe, the only way to prevent this is not to allow the judges to see the rehearsals and not allow them to mingle with the participants much. This would ensure that the contest is fair and is based on the current performance.